(REDLANDS, CA) – Those slightly cooler nights and early mornings are not a figment of your imagination, it is a sign that fall is around the corner, and so is the release of Hangar 24 Craft Brewery’s Oktoberfest Fall Lager. This well-received seasonal offering will make its first appearance at the Hangar 24 Tap Room in Redlands, and the Hangar 24 Lake Havasu City Brewery & Grill, on Saturday (Aug. 26) then find its way onto store shelves next week. 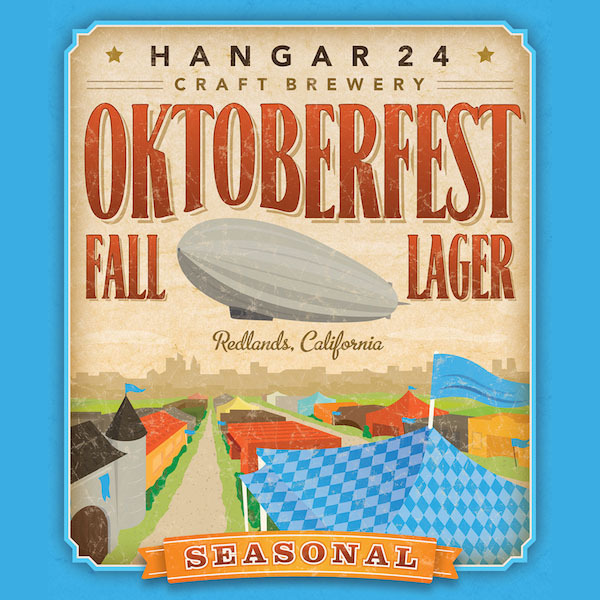 Oktoberfest Fall Lager is one of four Hangar 24 Craft Brewery seasonal releases. The others include Redlands Red Ale (spring), Wheels Up Helles Lager (summer) and Chocolate Bomber (winter). Clocking in at 5.7 percent ABV, with 23 IBUs, Oktoberfest Fall Lager pairs nicely with roast chicken, pork or German sausages. It also is complimented well with hearty breads, dumplings and sharp Munster or Dutch fontina cheeses. Oktoberfest in Munich, Bavaria, Germany won’t start until Sept. 16 this year, but you can get an early jump on the festivities with Hangar 24 Oktoberfest Fall Lager. While millions of liters of beer will be served at the Munich event, that lasts over two weeks, only a limited supply of Hangar 24 Oktoberfest Fall Lager was brewed, so get some while you can.